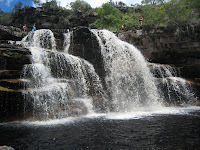 Located in the The Chapada Diamantina National Park, a 1,520 km² national park in the Chapada Diamantina region of Bahia state in the Northeast of Brazil...a paradise with many rivers, streams and cachoeiras (waterfalls), caves, hills, mountains, valleys and monoliths. 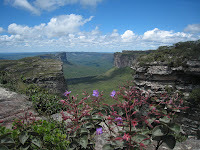 Chapada in Brazilian means a region of steep cliffs, a plateau. 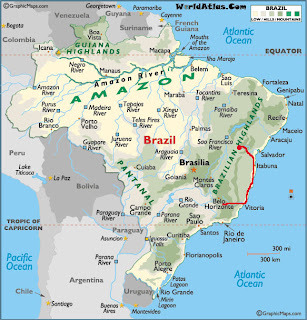 Diamantina refers to the diamonds found there in the mid 1800s. 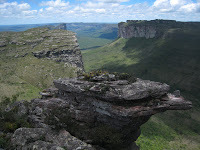 The National Park of the Chapada Diamantina (Diamond Plateau) established in 1985, contains an extraordinary variety of ecosystems and is the habitat of many species of plants and animals: bromeliads, orchids and cacti, Jaguatiricas (local feline), mocós (local rodents), deers and teiús (local reptile). 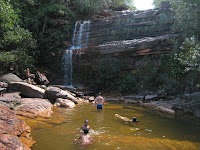 What is now a jewel of ecotourism was once a refuge of diamond hunters. 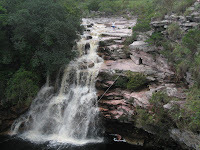 Cachoeira da Fumaça, 340m; the highest waterfall in Brazil and the second highest in the world, after Salto Angel in Venezuela. 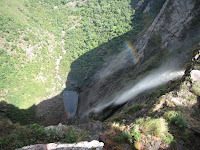 The 'waterfall of smoke' gets its name from the fact that the water evaporates before touching the ground, forming clouds of vapour. 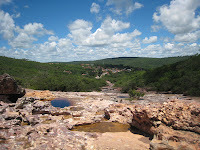 Morro do Pai Inácio, 1.120 m.
The landscape, the geological structure and the vegetal species that grow here are unique! 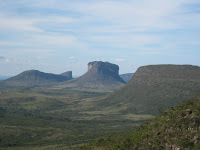 The hills of the Chapada were created by the erosion process that began in the Pre-Cambrian period, forming towers of minerals known as "TEPUY" by the local Indians who lived in the region before the arrival of the first settlers or “bandeirantes” around 1750. 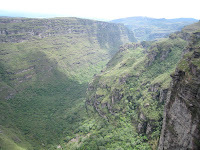 The most astonishing TEPUY like the Tambor hilltop, the Calumbi (also known as Morro do Camelo, or Camel Back), and the Morro do Pai Inácio, challenge time and feed the local legends. 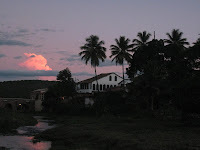 The Legend of Pai Inácio tells the story of a slave who fell in love with his colonel’s wife. 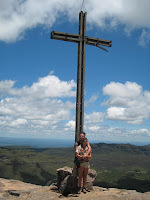 Chased by the guards, he found shelter on the top of the mountain but was discovered and jumped from the summit...that is what everybody thought! He actually hid behind a rock a few meters down the promontory. He then ran away with his loved one and was never found again. ...and another legend was born on January, 15th!!!!!!!!!!!!! Never saw such a magical place!! Too beautiful for words!! The fairy took him in her arms connecting their heart...as one!! Forever!! 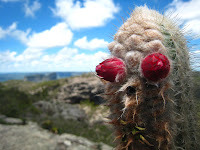 That's the most beautiful legend of Chapada Diamantina's region!! Together, they will build a real example of life in your true essence, full of love and peace. They were blessed, intergalactic ribbons will appear in the sky, and all saints wil will be singing in May 29 of 2009.